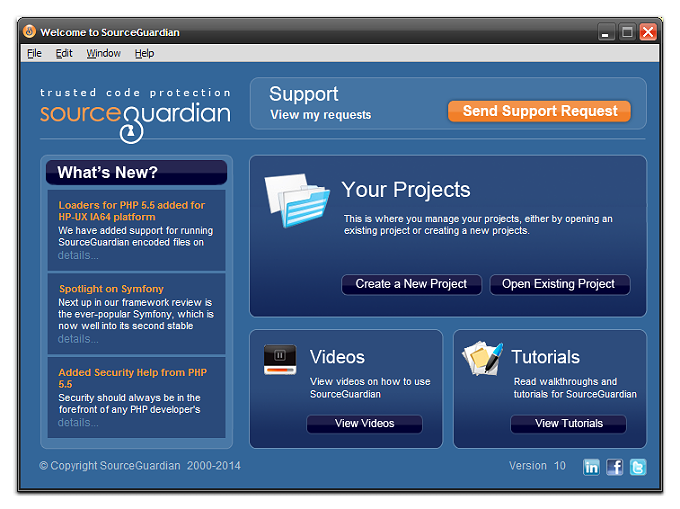 SourceGuardian was originally launched in 2002 and quickly became the professional choice for PHP code protection. Thanks to our early market entry, and the customers who put their trust in us, we've been able to develop SourceGuardian into the most advanced protection solution available, used by thousands across the world. Our team of programmers have created proprietary methods for encrypting code whilst keeping the maximum flexibility for the distribution of your scripts. We are developers also, actively developing applications in PHP, and we use SourceGuardian ourselves. As a bit of history, we created SourceGuardian originally for our own needs in 2002 as we needed to protect our own code and there was nothing else on the market at a good price point. After 10 years of protecting code we provide the most flexible and powerful PHP protection possible. The most exciting thing about SourceGuardian for us is how we constantly hear from our clients about how SourceGuardian has finally enabled them to distribute their commercial code and how developers are able to solve many of the problems that plague them when coding for a specific client. As for the future of SourceGuardian, we are really humbled with the huge uptake and acceptance in the market and we thank everyone who has purchased, downloaded or even taken the time to browse our site. We will continue to increase the functionality and power of SourceGuardian whilst always keeping an affordable upgrade path. The following provides you with an overview tour of SourceGuardian. We have created two videos for you to watch – one on installation and the other as a general overview. The following will give you an overview on how to protect PHP scripts using SourceGuardian. We will focus on the Windows version of SourceGuardian, but the process is very similar for Mac OS X and Linux. The following covers using the GUI, but if you wish to see how to use the command line interface works, please see the documentation in the support area. You write your PHP Scripts! In all seriousness, you probably have a PHP project that you already need to protect. Your project may consist of many files, with many includes or it may include only one file. It doesn’t matter as you can protect it anyway. You run the SourceGuardian encoder, create a new project, add your PHP project folder or separate files to it. Then you choose a destination directory where your encoded files will be written to. Next you can set the PHP mode, locking options and any advanced options that you require for protecting your scripts. You need to choose if your protected PHP code will under PHP4 or PHP5. You can also add locks to your protected files. This is a useful, but optional, functionality and is useful if you need to create a trial version or your PHP code or if you need to allow your code to work only with one domain, IP address or machine. You click “Encode” to run encoding for your files. Progress window will be shown displaying all encoded files. SourceGuardian protected scripts require the loader to be installed to run protected scripts. The Loader is required because source code is encoded with bytecode binary protection. The loader does the decrypting of the bytecode and runs it. The Loader is dynamic loaded library (shared object), which is actually a PHP extension. Loaders are free. Using the loaders does not require any license to be installed. You may freely distribute loaders to your customers, include them within your protected software etc. We have multiple loaders as they differ for different OS, CPU, PHP version and PHP thread safety option. Your SourceGuardian Encoder installation includes all loaders for all supported OS and PHP versions. Currently we have loaders for Linux, FreeBSD, Mac OSX, Windows, OpenBSD. All versions of PHP are supported since version 4.3. We update loaders to support new versions of PHP when they are available on the official PHP site. The latest loaders are available from our site. We suggest that you always use our online Loader Assistant to know the loader you need for your target platform and how to install it. Please also use the Loader Assistant to download and install an updated version of loaders. Creating a new support request SourceGuardian will automatically check, when opened, for new tickets. "Thanks for your support guys. Everything works just as you said - now I can launch my first product!"